Topics: Healing, Tai Chi & Chi Kung, Tai Chi Therapy, Indian Head Massage, Workshops & Retreats, and Private Tuition. It is hosted by Theplanet.com Internet Services Inc (Texas, Houston,) using Apache web server. 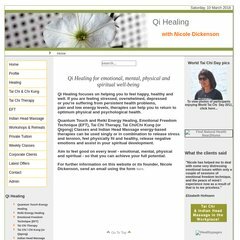 Qihealing.co.uk's server IP number is 74.53.227.130. Its 2 nameservers are ns381.websitewelcome.com, and ns382.websitewelcome.com. PING (74.53.227.130) 56(84) bytes of data.